Book cover image courtesy of Kepustakaan Populer Gramedia. A schoolgirl falls in love with her teacher; a priest defends a rural village and loses faith in God; a woman plans an affair with a married man. Such are the plot lines in Ayu Utami’s Saman, a 1998 romance novel that became a cultural sensation in Indonesia following its publication. At first glance, Saman is a simple love story, keeping with many conventions of that genre. However, as it deals with the thorny issues of religion, sexuality, and governmental oppression, Saman demands a second look. Credited with starting a movement of young female authors known as “sastra wangi,” or “fragrant literature,” Saman attacks many topics that are sacred or taboo in Indonesia. As a result, the book became a magnet for both controversy and acclaim, winning the Jakarta Arts Council Novel Competition, the Prince Claus Award, and selling more than 100,000 copies in Indonesia alone. Published two weeks before the fall of President Suharto, Saman describes a world that is constrained by oppression. The book is divided into four chapters, each following a different character and using a distinct style. The first is narrated by Laila, a young Muslim woman who has traveled to New York with plans to have an affair. The second follows title character Saman, a young priest, as he attempts to defend a rural Sumatran village against a palm oil company, becomes a fugitive, and leaves the priesthood. The third follows a dancer and childhood friend of Laila’s; the fourth, and shortest, is a series of increasingly sexual emails between Saman and a woman named Yasmin. Reading Saman, it is easy to understand why the book ignited so much controversy. Throughout the novel, Utami is deeply critical of the power structure under Suharto. In the second chapter, for example, Saman compares police officers to pigs: “Their faces flashed into his mind, the faces of wild boars: greedy, cruel, spiky-haired…. ‘Who are you?’ Wis asked. ‘Officials.’ ‘From where?’ ‘Just officials.’” The book’s criticism of religion also garnered controversy in Indonesia, a deeply religious country where atheism is illegal. Finally, the book’s open depictions of female sexuality – including its depiction of a Muslim woman who contemplates adultery – outraged many and became a touchstone for debate. One well-known poet, Taufiq Ismail, denounced sastra wangi as pornographic, suggesting it be renamed sastra syahwat – genital literature. In its English version, Saman won’t impress with its prose style. It includes some beautiful lines, like when one character describes Laila as “an onion: when the dry crispy skin is peeled off there is another layer beneath it, a layer that stings the eyes and makes you cry.” However, such passages are few and far between, and many of the book’s other sections are dry and tedious. The second chapter is particularly guilty in this regard, dragging on in long paragraphs that lack lyricism and description. To be fair, this is probably the fault of the translation – many Indonesian critics praise Saman for its rich language, and Utami herself has expressed disappointment with the novel’s English version. 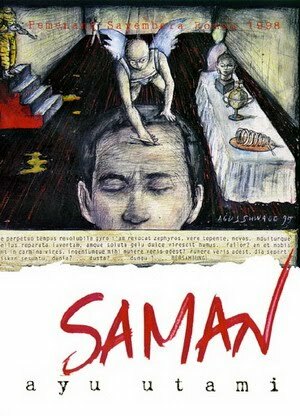 Still, what Saman lacks in poetry, it makes up for in its value as a cultural document. Today, the movement Utami began includes a variety of young female voices, including Dewi Lestari, Fira Basuki, and Djenar Maesa Ayu. Though it still remains controversial, Saman opened the door for these and other women to write about previously untouched subjects, transforming the world of Indonesian publishing. A quick read, Saman still offers plenty of insight for any foreign reader looking to learn about Indonesian social norms. In an era when Westerners typically hear about Indonesia’s growing conservatism, it is useful to remember that Indonesian culture includes other, divergent voices. With its broad critique of social institutions and tradition, Saman offers a window to one small part of that culture, highlighting the diversity of a country with many religions, customs, and conflicting ideas about morality.